To recap the results: The new mayor is Betsy Hodges. The charter amendments passed, to our dismay, by a huge 80%. And in the 12th Ward, where we sat sipping artisanal ales and watching the first sloppy, wet snow of the season, Andrew Johnson, a mere 29 years old but obviously an old soul in political terms, swept the City Council race to win on the first rank count. Our favorites, Carol Becker and David Wheeler, easily won the top two spots for continued seats on the Board of Estimate and Taxation. Two apparent winners in the at-large park board race are John Erwin and the Green Party’s Annie Young, while the contest between Meg Forney and Tom Nordyke for the third seat is too close to call. Stephanie Musich was unopposed for the park board district seat. The really important thing in this post-election punditry game is being able to say “I told you so!” So, how well did I do, on my public predictions from the RCV article of October, and from two other private predictions I will share with you? About 50/50. In October, I predicted lower turnout than 2009. I am happy to say I was wrong about that! Space does not allow me to massage the numbers as I would like, but I will point out that part of the apparent drop in turnout in 2009, and this is still a factor in 2013, is the great increase in voter registrations, the number the raw turnout is divided by to get the percentage, and this was due to the Obama effect. So turnout was better at about 34%. I was also wrong about the number of counts it’s going to take. Minneapolis surprised me here, with the clear clustering around mainstream candidates. Another prediction was lots of undervotes. Here again, this did not happen as much as I expected for the mayor’s race. But another race, that I didn’t even look at, and perhaps should have, the at-large park board, is very strange, and shows a clear lack of understanding by the electorate of how RCV works. For this race, three openings existed, and as per the rules, each ballot got three ranked choices. This is the part of RCV I really don’t like, because it feels like your voting choices are diminished rather than increased. The threshold for a majority is just 25% plus one. Well, of all the races to undervote on, this one had a 25% undervote! I can’t imagine why this was. My two private predictions: My friend Captain Jack Sparrow was convinced that he was going to exceed my other friend Doug Mann in votes, mainly because of all the press attention he has received. I said no, Doug would do a lot better than CJ, because he’s a serious candidate. This is a sticky topic, because I voted for, supported and donated money to Mann, while in Sparrow’s case, all I did was teach him how to blog and argue with him a lot to help sharpen his mind. My prediction was correct, but by a tragically small margin. I am really disappointed that Doug Mann did not do better in this race. He came in 10th out of 35. * The other prediction: that Mark V. Anderson, purely because of his name, would do very well amongst the fringe candidates. I thought inattentive voters would mix him up with Mark Andrew. His campaign was almost nonexistent, yet he got 1%, outranking 21 other minor candidates. But actually, I was kidding about the “I told you so” factor. The really, really important question is what did we, the Minneapolis FLA and the progressive left of South Minneapolis, get out of this race? Obviously, we did not get everything we wanted. But I think we were a big force in giving a high profile to at least three issues that would otherwise have been swept under the rug or at least not as hotly debated. The first was education, specifically the racial gap and the poverty gap. Yes, the mayor doesn’t control the school board, but that’s not the point. We all agree, I think, that it still matters where a mayoral candidate stands on a lot of make-or-break issues, whether they are city policy or not. And the state of our schools has become such an issue. The second was the Vikings stadium deal. We still don’t know the outcome of Doug Mann’s petition for a writ of mandamus against the city, and we can only speculate how a successful outcome before Nov. 5 might have affected the vote. But the stadium deal was another hot button, and that was largely due to our constant agitation on it. The third was the garbage burner. This may have been the stealthy assassin that killed establishment candidate Mark Andrew’s chances. And again, this was our issue and one we will continue to bring to the fore. On the charter amendments, we just lost. Maybe we can say “I told you so” on that down the line a bit. We hope that we will have the ear and the respect of the new mayor due to our visibility and strength on these and other key issues, and due to our third-choice “endorsement” of her by this paper (and our fair and deserved attacks on her main opponent). And finally, in a few key races, we were able to back the right candidate and see them win. It felt great to be in the Northbound Smokehouse Brewpub for Andrew Johnson’s fully deserved victory celebration. It should be noted that Doug Mann finished 10th place in the first, second and third choice votes citywide. However, a very large majority of the first choice votes for Doug Mann came from the Southside Pride delivery area, where he generally ranked 4th to 8th place. His largest first choice vote totals came from wards 9, 12, 2, 11 and 8 (in that order), all in the southeast quadrant of Minneapolis. 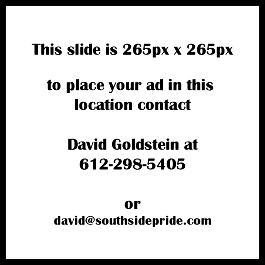 Southside Pride ran articles about the stadium lawsuit in July, August and September issues, and endorsed Doug Mann as its first choice in the October editions of the paper. It stands to reason that support from Southside Pride put Doug Mann in the top tier of candidates within the Southside Pride delivery area, just as the decision by the rest of the print media to shut out Doug Mann’s campaign had something to do with Doug Mann not being among the top eight candidates on election day.